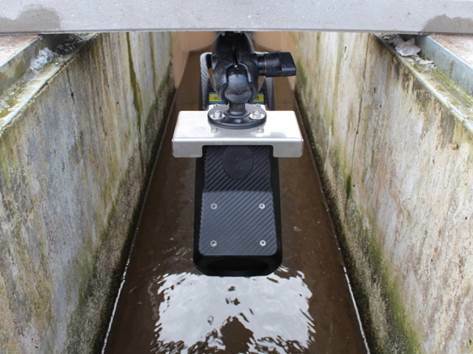 Other sensors such as Water Qualities (PH, ORP, DO, Turbidity, Salinity) can be added. SS304 Stainless Steel Sensor Mount Fixtures. The PM052FG / Tscada-FG s an advanced wireless RTU and Real Time Wireless SCADA Remote Monitoring and Alert designed for use with Flowtronics Raven-Eye Non Contact Radar Flow Velocity Measuremnt. Including in the systems is Globalwater RG600M or Texas Electronics Raingauge (or can be use with RM Young Raingauge), and WL450 Hydrostatic water level Sensors. The entire system is solar powered as the RTU consume very little power. As the PM052 RTU can be expanded, other digital or analog sensors (4-20mA) can be added including Insitu complete range of Aqua Sensors (DO, PH, ORP, Salinity), Turbidity Sensors, as well as Weather sensors such as Solar Iradiant, Wind Speed, Wind Direction, Temperature, RH, Soil Moisture. For location without GSM or Radio coverage, Testech has the SA020 Satellite Base Telemetry. The PM052FG is a capable Logger and Telemetry systems with custom Bi Directional communication capability with the Testech Tscada-FG. This allows the central monitoring systems to receive real time datalog, including AUTOMATIC backfill of data there were not send previously due to communication channel issues. This eliminate previous manpower and allows user to get all data for a meaningful analsysis. The Testech PM052FG is more than just a datalogger the customised firmware is customised for EACH digital sensors allowing real time sensor compensation (for example all sensors are affected by temperature, Barometric Pressure, Salinity, Water Levels). The Radar sensor are compensated in real time with the Ultrasonic or Hyrostatic level sensors, the DO sensor are compesated in real time with the Hydrostatic Pressure sensors and PH Salinity Sensors in real time. This allows all the data to be VALID. The actual sensors measurement are display the PM052 RTU LCD display includign communication status with the SCADA allowsing for minimal field maintenance trip. Virtually all setup can be remotely configure from the TSCADA-FG. PM052FG is design to optimized on low power consumption, as such it requires very low battery capacity even when continuously measures and sending data, PM052FG draws no more than 1.2W @12V in worst case. As opposed to 4-20mA sensors the digital sensor draws very little power. This reduce the size of the battery and solar panel greatly, the system can continue to run for 14 days even without sunlight. TSCADA-FG is a windows base SCADA designed specifically for remote Monitoring and Control of Weather and Water Qualities measurement. Tscada is optimised for wireless communication as such it features automatic data backfilling without requiring user interventation to retrieve missing data lost due to communication channel broken link, or wireless link having poor reception at the remote site. The wireless link can be GSM, GPRS, WIFI, Ethernet, Satellite, as well as Radio Link. TSCADA-FG is very user friendly feature real time data grid and real time trend update. Historical data can be retreive with user specified date time range. Rainfall data are in realtime tip over 5minutes interval viewable in details barchart and numerical data. Remote site can be remotely configure, as well as on demand adhoc retrieval of datalog from the Testech Wireless Datalogger without incurring expensive voice call. Even our satellite systems does not requires expensive satellite analog data connection connections. The TSCADA-FG supports XML allows user and system integration to retreive the database and develop their own webserver or Webserver on top of the TSCADA-FG. Testech has the Webserver addon for customer that chose to use a ready to use webserver, allowing remote login using any standard webbrowser from desktop or smartphone (support Apple Safari from iphone/ipad/Mac, Android Handphone, Windows Internet explorer, Google Chrome, Firefox). user can remotely login the website and view real time data as well as view historical trend and datalog in the field with a handphone on their hand.